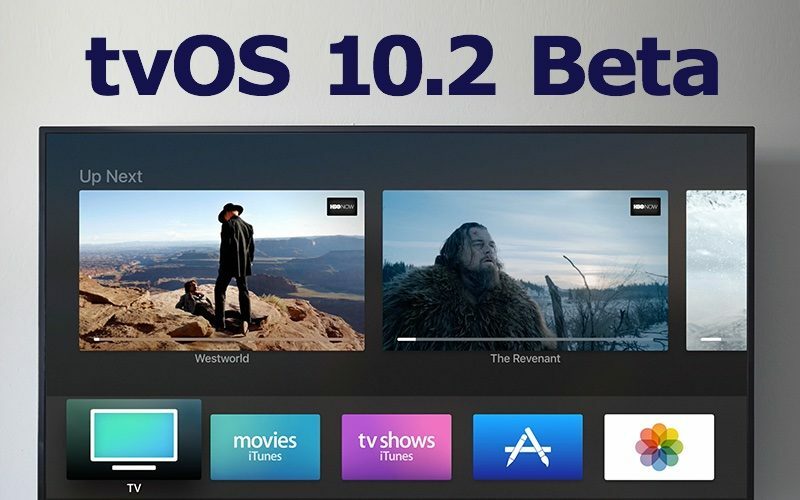 Apple today seeded the first beta of an upcoming tvOS 10.2 update to developers for testing purposes, one month after releasing tvOS 10.1, the first major update to the tvOS 10 operating system. tvOS 10.2 comes a day after Apple released tvOS 10.1.1. Designed for the fourth-generation Apple TV, the tvOS 10.2 beta can be obtained by connecting the Apple TV to a computer with a USB-C to USB-A cable, downloading and installing the software from a registered developer account via iTunes or Apple Configurator. We don't yet know what's included in tvOS 10.2, but as a 10.x update, it could potentially include new features and design changes above and beyond the standard bug fixes and performance improvements. We'll update this post should any new features be discovered in the tvOS 10.2 update. Scroll views with a lot of content now have a behavior that allows users to scroll through them much more quickly. Several large swipes of the Siri remote will automatically switch into this mode. Additionally, users can swipe on the far right side of the remote to navigate specific indexes. If you see any unexpected behavior in your applications from this feature, please file a bug. To add to this, I would love the option to stream audio from one source while viewing video from another source. Or, to mix the two audio streams together. E.g., listening to Pandora while watching a baseball game. I just want universal search to handle home sharing content. Apple needs to get on board with h.265 support and 4K/HDR soon, hope this is the year for a new ATV which supports these features. ATSC 3.0 support is also high on my list! My biggest request would be a picture-in-picture mode similar to what's on iPhone/iPad and even the Mac. On Apple TV it would essentially be a way to keep a video playing....while looking for another video to play. Not a totally useless feature, but with such a singular purpose its definitely far down the list of priorities. I think there is great opportunity to mix non-video apps with video apps if there was PiP. This is particularly useful with sports or music videos, where you don't really need undivided attention to the video. For example, checking the weather while watching a music video; playing a quick game while watching baseball in the corner. Indeed, the fact that a video wouldn't necessarily pull you away from a non-video app might encourage more non-video apps to develop for the ATV. Not necessarily. I would love PiP similar to what TV's have had for decades. Would love the ability to watch two games at the same time across apps (i.e. ESPN and Watch TNT) or quickly switch between streams/apps when a commercial hits. This one may be harder, but I've found selecting via multi task menu to be slow, as the app you are switching to needs to re-buffer. I hear Apple offers a $149 add-on for PIP with compatible television sets. You just plug the add-on into HDMI2 and use the PIP on the TV to control PIP location/size/contents. Works great! Or, if you are budget-conscious, $5 of double-sided tape can affix an iPad mini to the bottom corner of your TV set so you can see two things (mostly) at once. Not quite as easy to configure where the inset picture goes though. Sorry, completely facetious, and I feel your pain. It's just that I've had PIP features on television sets since something like 1991 and after the initial novelty have never seen a use for it. Today, if I want to multitask I have several second screens (iPad, iPhone, computers...) to choose from and would rather do that than lose a corner of the main thing on the screen I am (and others in the room are) trying to watch. I think there are a number of features seen as higher priority in the Apple TV dev team than PIP. I'd be interested to see how many Xbox One owners actually use this ability. They've got it, and you'd think it would make the most sense on a gaming platform (play a game while a show plays in the corner), but I suspect that it wasn't actually as useful as it sounds. As an original XBONE owner, I've never used it. In fact I never even connected my DVR/Cable to the input on the Xbox(I use WMC and hdhomeruns which aren't really compatible anyways, ironically). The only thing I've done is play music in the background when playing Forza. Music in the background of games/non-video apps is the only feature I'd say is even worth pursuing, as it's the only thing that's useful. With tablets at the prices they are it just doesn't make sense in my opinion to do pip video for anything other then web browsing. I can much more easily pull up a podcast or sports game on the tablet right on my lap then deal with the pains of multitasking/PIP. On the same device, adjusting volume of each source becomes a problem as well as the size and coverage of the window. I question how many people even ever used PIP back in the day, especially since most TVs didn't have dual tuners. Quick jump / previous channel are much more useful IMO. Just because it is low priority for you, doesn't mean it is for others and Apple. This is a standard feature on the traditional TV viewing experience that Apple is trying to replace. Using Apple TV makes it MORE difficult for me to enjoy my TV as I would like to. I think it's a given we'll see that eventually, but its actually less useful on Apple TV than iPad and Mac (there is no PiP on iPhone). On iPad and Mac, PiP is used to keep a video playing while doing other things like web, email, games, productivity, etc. Completely understand and fair enough. I actually have found myself wanting PiP more now on Apple TV due to the streaming era of TV. With standard cable, you can just hit the previous channel button to quickly swap between channels. With Apple TV, its a much slower process due to the loading and buffering of a new app. Even using the app switcher, it's just not the most ideal situation for quick switching.